Brad Paisley- Life Amplified World Tour- Live at WVU Trailer from City Drive Films on Vimeo. 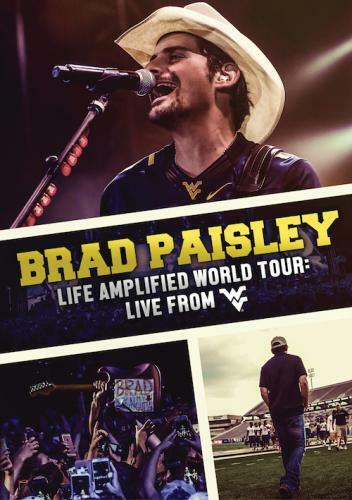 Life Amplified World Tour: Live at WVU is the new live concert DVD and CD from multi-platinum country superstar, Brad Paisley, which will be released Friday, December 23. Paisley returned to his roots by going home to West Virginia for a special outdoor concert at West Virginia University. Straight off the wildly successful "Life Amplified World Tour," the show was shot with 20 cameras in front of a hometown crowd of over 15,000 people. Paisley played an electrifying 2 hour show that included many of his 23 number one singles, such as "Mud on the Tires," "Then," and a surprise rendition of "I'm Still A Guy," featuring Chris Young. The show also includes a very special version of the John Denver song "Take Me Home, Country Roads," which has become an anthem for WVU. The concert will air on PBS on Friday, January 27, 9:00 - 10:00pm EST and is titled Brad Paisley - Landmarks Live In Concert: A Great Performances Special. Paisley takes his unique skills as singer, songwriter, guitarist and entertainer back to his home state as well as to viewers everywhere. "I am so pleased to be partnering with Brad on the WVU show," said Catullo III, who is also the CEO of City Drive Films. "Being an alumnus of WVU this show is very special for me. To be able to bring WVU to the world stage is something I am proud to do and I couldn't think of a better artist to do it with than Brad, who has similar feelings of WVU, having grown up not too far from the campus. It has been a dream of mine to go back to WVU and put on a huge show, free for the students." Songs included in the show are: Crushin' It, American Saturday Night, Water, Online, Perfect Storm, Letter to Me, This is Country Music, I'm Still a Guy (featuring Chris Young), She's Everything, Ticks, Country Nation, Old Alabama, Then, Beat This Summer, I'm Gonna Miss Her, River Bank, Take Me Home, Country Roads, Southern Comfort Zone, Mud on the Tires and Alcohol. Both the DVD and the CD/DVD can be ordered at the MVD Shop or on Amazon.